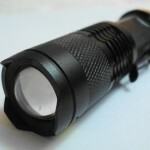 Home Flashlights AA Flashlights Cheap LED Flashlights – Are They Worth The Lower Price? LED flashlights have grown considerably in popularity. The technology, like anything utilizing the results of research and development, continues to improve. But flashlights have become much like any other electronic item, in terms of quality, you DO get what you pay for! 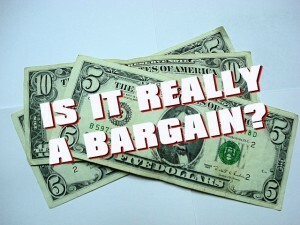 No doubt, most of us are on a budget and we always want to get the most for our money no matter what the product is. So how does all this pertain to cheap LED flashlights? Read on. Like anything we buy, amidst the quality products, there’s usually a knock-off available somewhere. 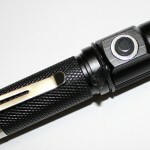 Let’s look at the major components of an LED flashlight, and decide which parts can be made cheaply. Many of today’s major manufacturers use a form of scratch resistant type III anodizing. The aluminum used is often aircraft (or aerospace) grade. This produces an extremely durable light! Virtually indestructible in fact. This durability will most likely NOT be present in a cheap knock-off light. Most flashlights today are waterproof. They’ll be designated as ‘Waterproof to IPX-8 standard’. This is an international classification meaning the light can be immersed in water. In accordance to a rating system known as FL1 Standard, waterproof will usually mean the light can withstand immersion 1 meter deep for 30 minutes. Most likely the cheaper light cannot withstand much more than simply getting splashed with water. Lights are available for divers where underwater operation may be needed for up to four hours at a time. For these lights, the meter depth would be listed on the package. Look deep into my LED!! 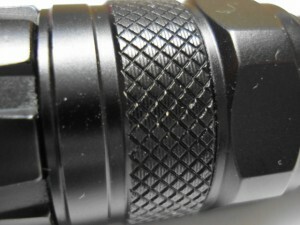 The emitter is perhaps one of the most important parts of a flashlight. Deep in the center of the reflector is what produces the beam of light. Emitters have come a LONG way over the past decade. CREE is the major manufacturer of emitters. 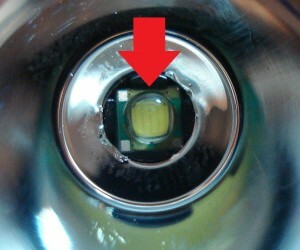 Just about 100% of all LED lights will feature a CREE emitter. Basically, a cheaper LED light will feature older, first generation emitters which when compared to some of the newer emitters will be somewhat less efficient. This means two things; the light will not achieve as high a brightness, and the overall run-time of the light could be significantly less. If you see a flashlight with the following description; Cree XR-E Q5-WC LED emitter; or XR-E R2… you are definitely NOT getting a product utilizing the latest technology. If the light you’re looking at features an “XR-E” LED, then you’re looking at something that was cutting edge, back in 2006!! This post describes different LED’s in more detail. The advancement in emitter technology has also lent itself to better regulation and overall efficiency, as mentioned above. In plain English, this means that in most cases your batteries will run the light longer. In turn, the electronics will keep the “driver” working harder to provide the maximum amount of light even as the voltage (due to a weakening battery) begins to drop. 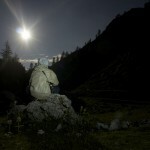 Most, if not all LED flashlights will get hot after a few minutes on its highest setting. Again, depending on price, good heat dispersion will be a factor. For the cheaper light, this could shorten the life of the electronics. If the entire body of the light gets hot, the batteries might be affected as well. Too hot to handle can be taken literally in this case. 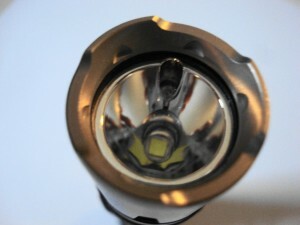 The pricier light might often feature “fins” that dissipate the heat, while some even “step-down” automatically (in lumens) to a safer output if left on high for more than a few minutes. The reviews from many users of cheaper lights have complained how hot there’s became after a short time. Excessive heat from the LED occurs naturally, but should be monitored. Some lights handle it better than others. The point is, heat can shorten the life of the unit. Although unpredictable, your best resource for this are user reviews. 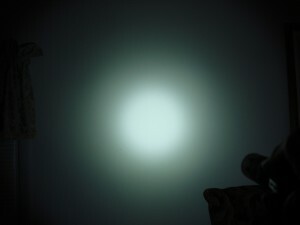 Another BIG consideration when pondering the purchase of a cheap flashlight, is beam pattern (or profile). The photos illustrate both a “classic” LED beam from a brand-name light and one from a cheaper lesser-known brand. You can see in pic 1 that the brand-name beam is basically smooth from the spill area, right up to the corona and the hot spot. When the head assembly in any given light uses either cheaper components, or isn’t assembled correctly, the beam might feature several artifacts which are comprised of “rings” around the beam, or an noticeably uneven beam. 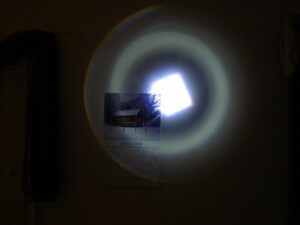 The beam in pic 2 also illustrates when the shape of the LED is noticeable…creating the “squarish” appearance in the center. The electronics in each light will probably not vary too much. The rear clicky switches will most likely function much the same. 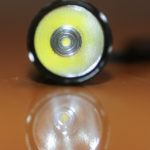 However reading reviews from a handful of users who’ve bought a light for less than $10, have reported faulty switches. What you’re paying for in a good quality light, is the overall construction, its durability, and its ability to actually work when switched on! It would be foolish to say that brand doesn’t also play a factor in price. This is true with everything. Wouldn’t you assume you’d pay more for a Sony TV, vs. one made by Sansui? Consider though that a great deal of research & development has gone into these tools. And tools, are what they are. A cheaper LED flashlight may often not feature the voltage range of its more expensive cousin. The voltage range of a lithium battery-based light will often be as high as 8 volts. This allows for a greater choice of battery configurations. On the cheaper end, the voltage range might not be noted, nor will there usually be an instruction manual with the light you receive. Therefore a single 18650 battery light, (3.7 volts) may not accept two CR123’s as an alternative, since that means the light would need to accommodate over 6 volts. The majority of flashlights on the market are assembled with quality components which work to provide constant light through regulation. This means that the level of brightness you see will remain CONSTANT until the battery can no longer provide ample voltage. In most cases, the circuits found in the cheap lights will not have the ability to regulate output. This means the beam will begin to deteriorate quickly with each use. It will loose brightness at a steady rate until the battery is dead. Admittedly, this is how flashlights that ran on standard C, D or AA batteries have performed since their invention. But, with the introduction of LED’s and intelligent circuitry, we’ve become accustomed to a more uniform output. Ultimately, the final decision is yours. If you’ve recently discovered the world of LED flashlights and are interested in building a collection, one based on low-cost alternatives might be one that you’ll discover needs replacing more frequently. A quality name-brand light (more often than not) should last for many years! Yes, we realize how electronics can become obsolete from year to year. But the advancement in LED’s has grown so much over the last five years, that it’s unlikely it’ll change THAT much again, over the next few years. 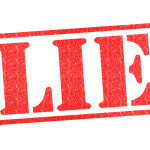 The issue most pronounced with many inexpensive lights lies in the claims by their manufacturers. I cannot honestly say that I’ve never been aware of any product exaggerations in a name-brand light. This cannot be said for many of the cheaper brands. It’s usually in lumens where they tend to inflate the numbers. They like to boast higher lumens than the light is capable of producing. What are the brands to look for? Fenix; Nitecore; JetBeam; Sunwayman and Olight… just to name a few. What price can you expect to pay for a quality light? For one of the brands listed above, at LEAST $35.00 for a AA battery light. 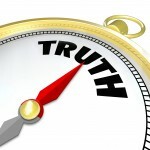 The age-old adage, “let the buyer beware” is still as true today as it ever was. Questions or comments? I’d love to hear from you! 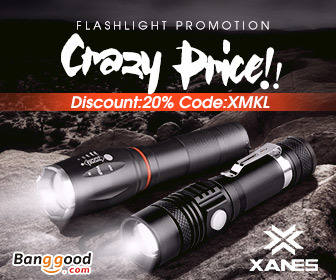 You can compare prices on quality flashlights here and here. 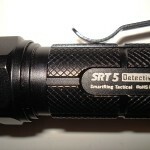 Nitecore P16 XM-L2 LED Flashlight Review. Came here from the YouTube link. Thanks for this article. Great site. I’ve bookmarked it. Glad to have you aboard Captain! I work hard on this stuff, so I’m glad you’re finding it useful. That’s true to a point, but if you plan on using the light a great deal, then spending the extra on something of higher quality is going to provide better, longer-lasting performance. And I thank you for your comment!